Here is the first '75 Topps Mini that I ever got signed. I have only known about this set for about eight years it is still something that I have never seen in-person, except for the three cards that I have bought. So, if I can find a good deal on them from COMC when I am buying cards that I think I can get signed, I cannot pass these up. A couple of years ago, the Royals started having alumni come to their Sunday home games. That is pretty nice as Sundays are usually the games I go to. 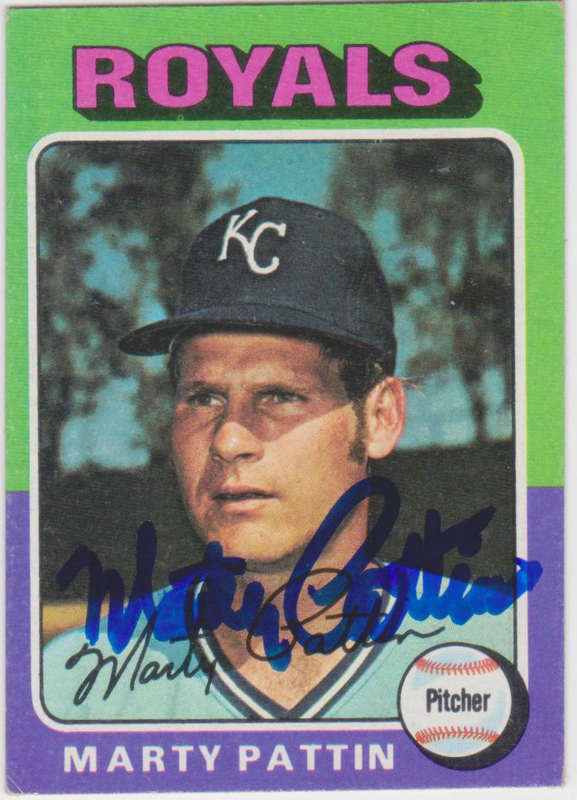 Autographs have been getting harder to obtain at the ballpark on Sundays, so it is good to know that I should be able to come home with at least one autograph as long as I have a large, varied selection of Royals alumni cards with me at every game. 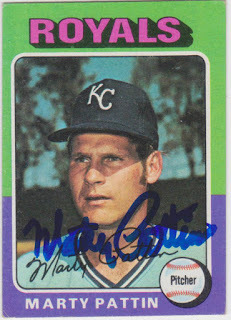 That is how I got this Marty Pattin card signed. I bought the card for Fanfest a few years back and was able to get it signed at a Sunday game in 2015. Here is something I haven't posted in some time- a recent addition to my collection. Most of the cards I have been posting have been waiting to make it on here for up to three years. Not this one. 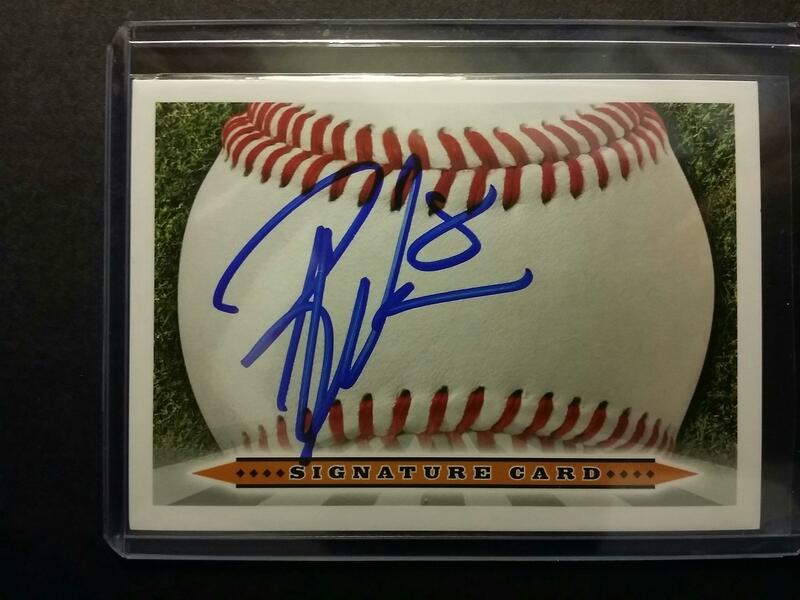 I got this card signed in Kansas City less than three months ago when the Tigers came to play the Royals. Gene is the Tigers bench coach and he was nice enough to sign two cards for me after hopping off of the bus at Kauffman Stadium. Gene spent his entire Major League playing career with the Tigers. That career spanned five seasons, but he only got into 87 games over that span. He spent most of those summers playing for the Tigers AAA affiliate, with one summer playing for the Braves top minor league team. It seems that Gene was just the Tigers third catcher and they would call him up when they needed him. Gene made his Major League debut in 1970 and did well in the 15 games he got into. He hit .295 with 3 doubles, a triple, a home run, and 4 RBI. That one home run he hit came in his first Major League at-bat. But, the following season, he would only get into 7 games with the Tigers. The year after that, he got into one game and did not even bat. 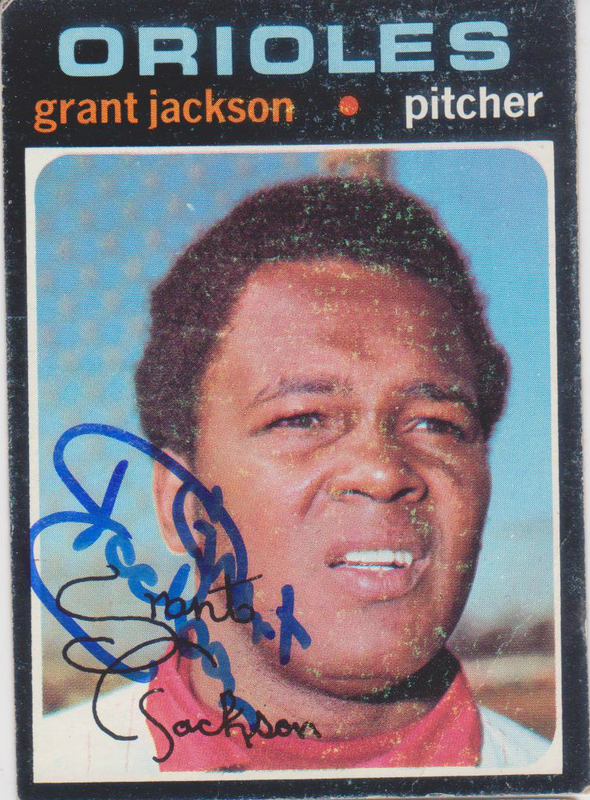 He spent the '73 season playing for the Braves organization before rejoining the Tigers in '74. That season, he got into a career-high 60 games. He .217 with 4 doubles, 3 home runs, and 8 RBI. He was back in AAA the following season, though, and got into just 4 big league games that year. He would play one more full season of AAA before calling it a career and joining the coaching ranks. For his career, Gene hit .233 with 4 homers and 14 RBI. Here is the second card of Barry Foote that I got signed through the mail in 2013. I posted the first one, his '81 Donruss, not long after it made it back home. The two cards took Barry ten days to get back to me. While this card is not the best card to get signed because of the dark background, it does have two things going for it. The first is that it is from the '75 Topps set and the second is that it has a Topps Rookie Cup. I am not sure when Topps switched from the trophy to the cup, but this has got to be my oldest signed card with the actual "cup" on it. 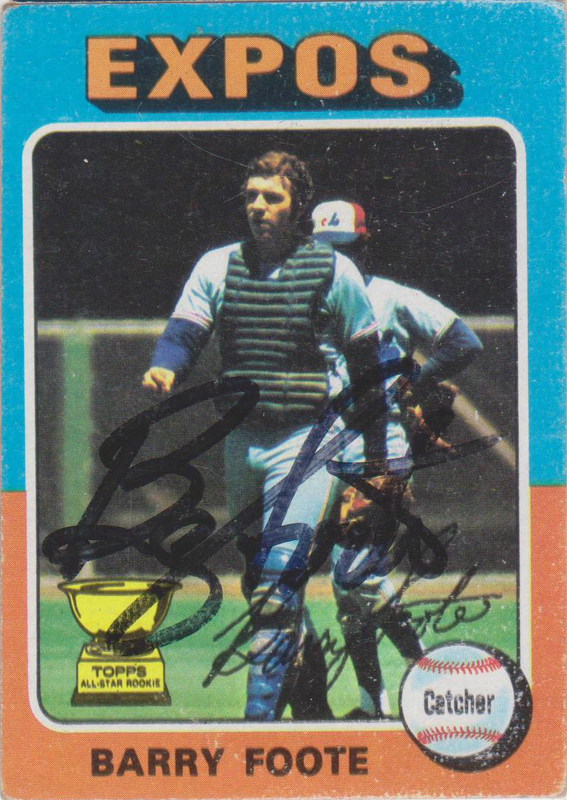 Barry earned that Rookie Cup that year by hitting .262 while driving in 60 and hitting 23 doubles and 11 home runs. On top of that, he lead the league in sac flies and assists by a catcher. Those 60 RBI and his .262 average would end up being career-highs for him. Barry went on to play for eight more seasons after that with the Phillies, Cubs, and Yankees. After leaving Montreal during the '77 season, he was mostly relegated to back-up duty. The one exception was with the Cubs in '79. He played in 132 games for them that season and hit a career-high 16 home runs. Barry finished his career a .230 hitter with 57 home runs. 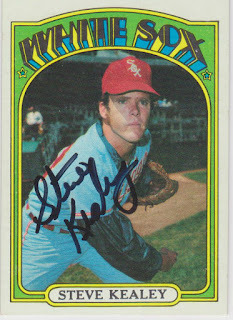 Here is the third and final card of Steve Kealey that I got signed at Rock's card show last year. You can see the first card of Steve that I posted here and the second one here. Those first two cards showed Steve with the Angels. After three up and down seasons in California, the Angels shipped Steve to the White Sox just prior to the 1971 season. He would go on to play with the Sox for three seasons and get the bulk of his Major League time. With the Sox, he pitched in 101 games and went 5-4 with 10 saves and a 4.50 ERA. In 1971, he had career highs in innings (77.1), strikeouts (50), and saves (6). Counting his time with the Angels, Steve had a career line of 8-5 with 11 saves and a 4.28 ERA. The three cards I posted of Steve show a nice progression of eye-wear. His '69 Topps has him in sports goggles. He then swapped those out for some wire frame glasses on his '71. Then, when this card came out, Steve was either wearing contact lenses or forgoing glasses altogether. I am all moved and nearly settled in, so I figured it was time to start posting some cards again. 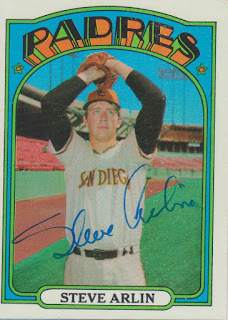 Here is a card of Steve Arlin that I got signed through the mail in late 2012. This card took Steve less than two weeks to return to me. Steve did not have a great Major League career. 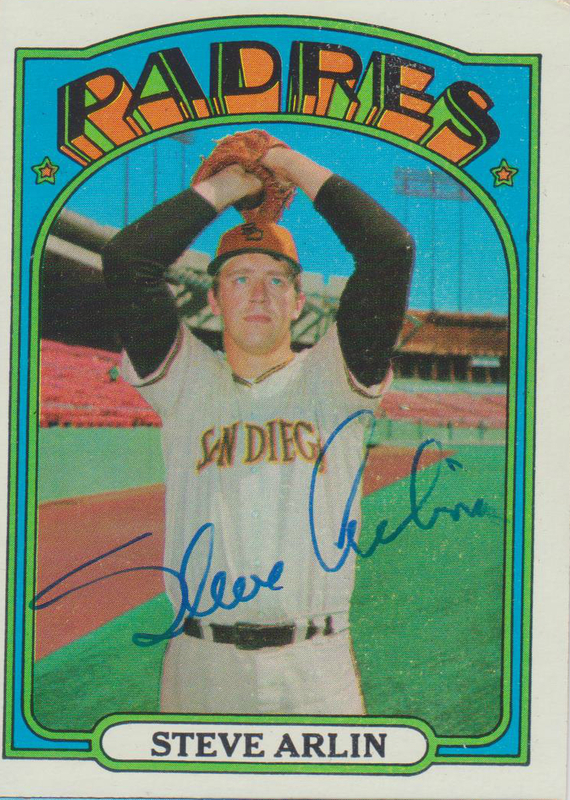 Playing on the Padres expansion team from 1969-1974, Steve went 32-62 with a 4.19 ERA. He led the league in losses in 1971 and '72 with 19 and 21 losses respectively. He also lead the league in walks (122) and wild pitches (15) in '72. 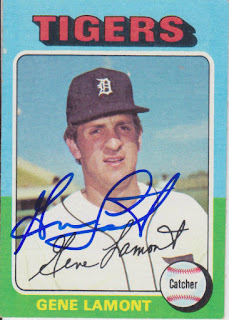 But, Steve's Major League exploits were not the reason I wrote to him for his autograph. As most of the regular readers know, I am a college baseball fan and have gone to the College World Series each of the past ten years. Most people probably do not know that Steve Arlin is a CWS legend. Steve pitched for Ohio State and led them to Omaha twice. He made the All Tournament team both times and led his Buckeyes to the 1966 National Championship. He set the record for most strikeouts in a CWS game when he fanned 20 Washington Huskies. It may have took him 15 innings to do so, but that only adds to his status. Over the two tournaments, Steve struck out 57 batters over 47 innings and had a 0.96 ERA. Sadly, Steve passed away in August. It has been well over a week since I posted last and it may be just as long until I post another card. Besides working too much over the last two weeks, I have also been going through the process of buying my first home. We started moving into that today. Once I get this computer torn down, who knows how long before I have it up and running. 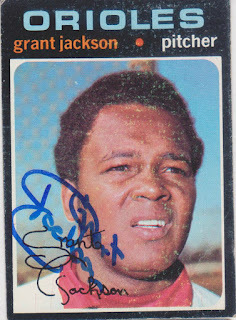 Here is a card of Grant Jackson that I got signed through the mail last year. I picked this card up at the Wichita card show to send along with Grant's '81 Donruss card. This card is not the best looking card around, but it is a '71 Topps so I cannot complain. It took just a week to get the cards back from Grant. That was actually my second try at getting Grant through the mail. I sent him three cards a couple of years before that and they never made it back home. One of those cards was from my Pacific Senior League set, the first and only card from the set that I have lost. Grant is a really good TTM signer, so I wonder what happens when cards never make it back to my mailbox. With me in the process of moving, I hope I do not miss out on any old returns. It has been so long since I filled out a change of address form that I do not know how long they forward that stuff along. You never know when a long forgotten TTM request will show up unannounced. Grant's signature has changed a bit from the fake one on the card. It is still a nice looking sig, though. I used to like collecting autographs as a kid. After many years away from the hobby (and baseballcard collecting as well), I have gotten back into it. I figured this would give me something to do and to show other collectors some of my cards. Donovan Osborne Autographed 1991 Score Rookie GIVEAWAY - Signed Baseball Card Giveaway Contest! 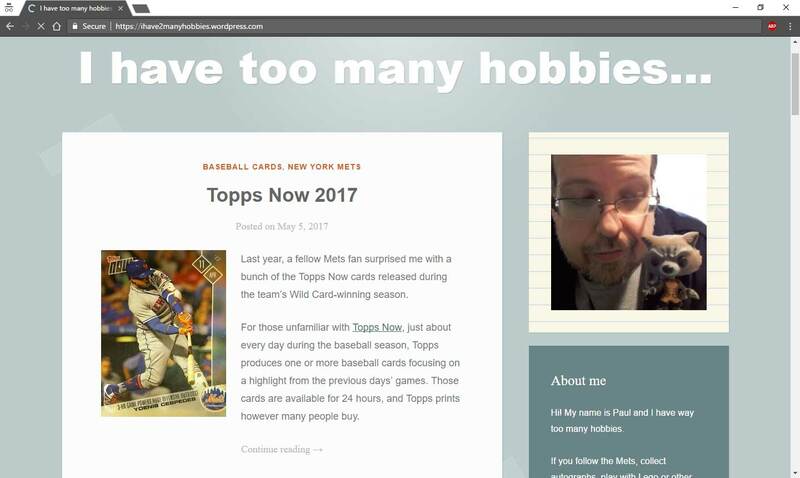 Follow @AutographRob and @TtmMailDay on Twitter!